The KST X08 is a very light (8 g) low/medium/high voltage metal cased servo. 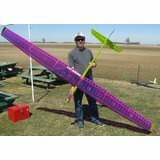 It is especially good for ailerons on discus launched gliders, electric racers, and all models with thin flying surfaces. Despite being only 8 mm thick the powerful coreless DC motor and gearing provide good torque and high speed. The X08 can be operated from a voltage as low as 3.8V (1S LiPo) or as high as 8.4V (2S LiPo). KST servos have excellent geartrain machining tolerances, and this servo is completely slop free, and equal to products costing twice as much. Despite not having an -MG moniker this servo has metal gears, and is very tough. The KST X08's high torque, good speed, and 8mm thinness make it suitable for many high performance glider, pylon racers and EDF applications. With up to 2.8kg.cm torque the KST X08 is appropriate for F3K, F5D, F5J, many types of high performance models. Feb 2017: We are now only selling the new V5 version (there wasn't a V4). It has improved firmware and electronics, giving even more precise centering and a greater throw. The extreme reliability and performance of these servos also makes them very suitable for use in film and motion picture industry special effect departments. They are also used in robotic, drone, UAV, UAS, academic research, military, and other highly demanding applications. 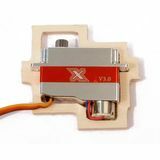 We're pleased you would like to review KST X08 V5 HV Servo - 2.8Kg.cm 0.09s 8.4g 8mm. I bought this servo on Neil's advice to replace a FrSky c2110 that had failed on my Loola DLG. Bit expensive but performance, resolution and centering are noticeably superior to the FrSky offering. Runs faultlessly on one cell Nice one Neil, I'll be back! Nice servos, haven't fully tested them in flight but accuracy and speed great so far in the plane. More than I wanted to pay for a small servo, but worth it definitely. Running them on 2 cells to remove the weight of the BEC in DLG. Good solid and tight, very precise. Not the quickest but that is no problem for me ! Best servos ever rock solid super smooth worth every penny! Very good servo for the price using on the sprite & the Circle Dancer 3600 great little servo. Very good resolution! Measured only 1us deadband on mine V5 servos. Very pleased with the quality and I have converted to only KST 08 type servos in Indoor models and MPX Parkmaster. You need good servos to enjoy the precision of your Control input. Have had 3 of these go awry over the past month. Welcome advice as to how best to fix it (thought I had, but not in every case). As usual Neils team does great service. They can't be held solely responsible for product failures. A really nice, small servo that works great for DLG and smaller gliders. Works with 2s lipo voltages which works great with my Graupner receivers. Wonderful servo and a bit lower in price, without sacrificing quality, than the competitor. Great servo. very light. Wide voltage range makes it an excellent servo to run of 1 or 2 cel lipo directly. Great little servo, and of course you receive the awesome service from Hyperflight. This is a truly impressive servo. It is amazingly tiny, built to the highest quality, and is very light. It has plenty of power and is reasonably fast. Highly recommended. 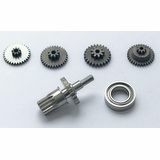 KST X08 V3 HV Servo - 8mm 8g 2.8Kg.cm. Neil has given me excellent service. I have recently e-mailed him twice with product enquiries, even before placing my first order. Neil responded within a few hours each time, with very useful replies to my questions. I have now just received my first order for KST X08 servos. They arrived in excellent condition and very promptly. The shipping charges to Canada were very reasonable, esp. when compared to international shipping charges levied by some other model supply companies. I have not yet tried the new servos as they will shortly be installed in a new Blaster 3 that is about to be built. nicely built servo, very rugged for its size. First class next day delivery - thank you Neil. These servos are tiny, too small for my intended use as MiniVec aileron servos but I will be fitting them into my Longshot dlg when I get the time. Ordered these revised versions from Neil a month or so back. Received my order as soon as they came live on the site. Fitted to my Alula Trek for super smooth and rapid response using in DLG mode. Many Thanks! Hyperflight refuse to sell servos to me, so I have to import these from Hong Kong. Completely ruined my preparation for the F3K World Championships because of the delay. Great support for your national team ? If you would care to reinstate my neil stainton FlyQuiet forum account I will be happy to send this order. If you would be so kind to issue a refund. He didn't reply when I asked why he wouldn't reinstate the account. I will of course be happy to supply him if he stopped excluding me from his forum, and posting partial comments. Good servo, good service, fast delivery ! 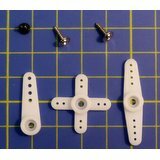 I have these servo's in a Avionik F5D. The first version had problems with a fully charged 2S Lipo. Now I have installed the new v3's in the racer and after 8 flights I can say they are performing very good. Very little slop and fast on 2S directly. Hopefully they will last. My recall replacement KST X08's arived the other day. These are the 'improve version', They were originally destined for a 'save weight progect' on my Avalon (4m Ava), so I was pleased that I could now continue. What suprised me when I opend the box was the servo cable has been moved from the end to the bottom of the case, making traditional bearer or tray fixing much simpler. The X08 simply drops in as a snug fit giving more meat for the srews to bite on. A very nice touch IMHO, simple and effective, as the bottom of the case is cut away, the wire exit is not interfeared with by structure. Be a good idea to show a pic., on the web listing? Thumbs up from yours truly . . .
Price and specs on this servo are great. Performance not so much. I bought 2 of these servos and 1 failed out of the box on a 6V system. The failure and subsequent recall of these servos has caused unwanted delays in completing my Super Supra. Ive ordered 4 times from hyperflight now, every time product has been dispatched promptly and arrived here (New Zealand) within a week or so. Great service, great products,helpful info if needed. My first choice for my F3k stuff. Servo wire could be a bit longer, about 25 mm. Perfect...the deliverytime short, price o.k. and a very good processing qualityof the servos. The KST x08 are ideal as aileron servos for hand launch gliders. Just adjusting fast and suitable with 1 or 2S Lipo. Tested them on the desk only so far. Feels well made, very strong for its size, barely noticable slop but a little slow at low supply voltage (1S). Have not yet flown with the servo's but tested them on the ground. They look precise rather quick and strong. Work great in my MPX system, but they were not stable on my servo tester. These digitals probably need quicker update rate than 22 msec. I use 14 msec on my RoyalPro. We have to see how they last in the Wings of my Helios-2 DLG. I ordered these for F5D. Very nice and small and a good supply of control arms. Unfortunately not "completely slop free".